WSFFM has launched a program to monitor the weight of participants who do SAB20/30 exercise on a regular basis. The baseline observations to be taken are: weight, height, total body water and fat, muscle fat, blood pressure etc. This program is offered free to volunteers. The measurements are taken once a month on a Friday at Taman Lembah, Bukit SUK, Shah Alam. 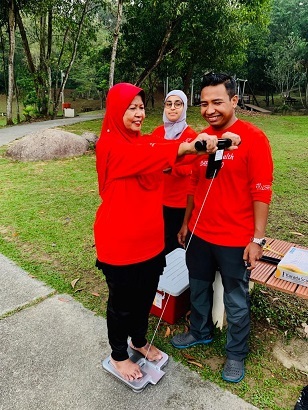 In addition WSFFM is planning to select a sample group of members who will undergo monitoring every Friday to aid them towards achieving a better weight lost target for a duration of 8 consecutive weeks.